This happens every now and then – something funny will pop up in the service alert. Today we are presented with a new subway station name that combines the best of two stations. You have Jamaica-Van Wyck. And you have Briarwood/Van Wyck Blvd. Put them together and you get Jamaica-Van Wyck Boulevard (see the image below). 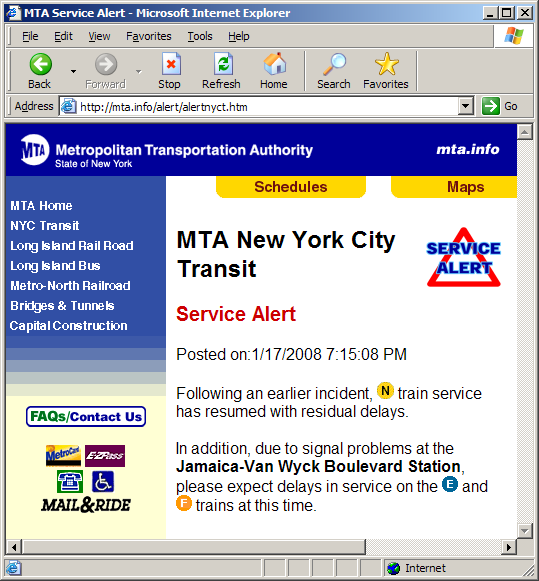 This entry was posted on Thursday, January 17th, 2008 at 7:38 pm	and is filed under service alert. You can follow any responses to this entry through the RSS 2.0 feed. You can leave a response, or trackback from your own site.